The First Quarter Moon is Friday September 9. Venus and Jupiter form a line in the twilight. Mercury is lost to view. Mars and Saturn are visible all evening long and form a triangle with the red star Antares. 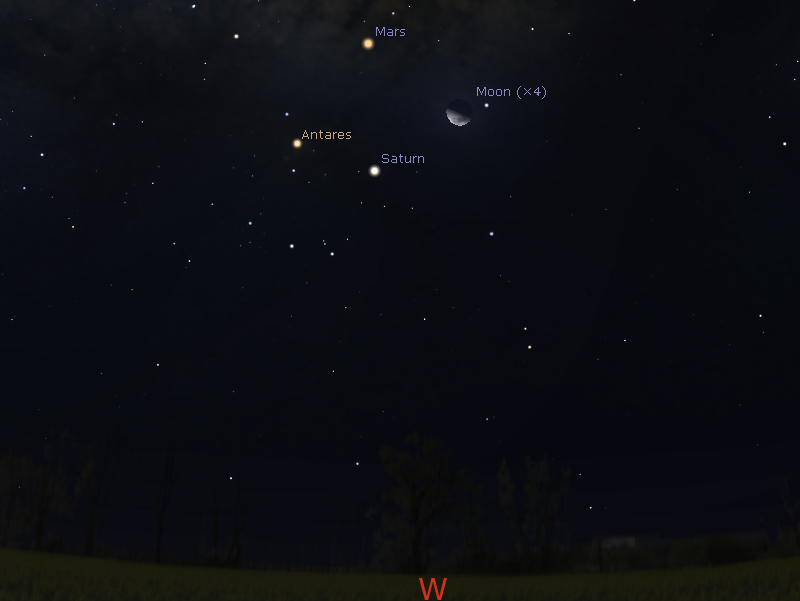 On the 9th Mars, Saturn, the Moon and Antares form a kite shape. The First Quarter Moon is Friday September 9. Evening sky on Saturday September 10 looking west at 40 minutes after sunset. Jupiter and Venus form a line above the horizon. 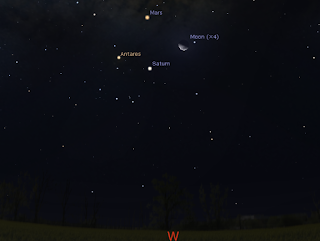 Similar views will be seen throughout Australia at the equivalent local time. (click to embiggen). Jupiter was at opposition on the March 8th, when it was biggest and brightest as seen from Earth. 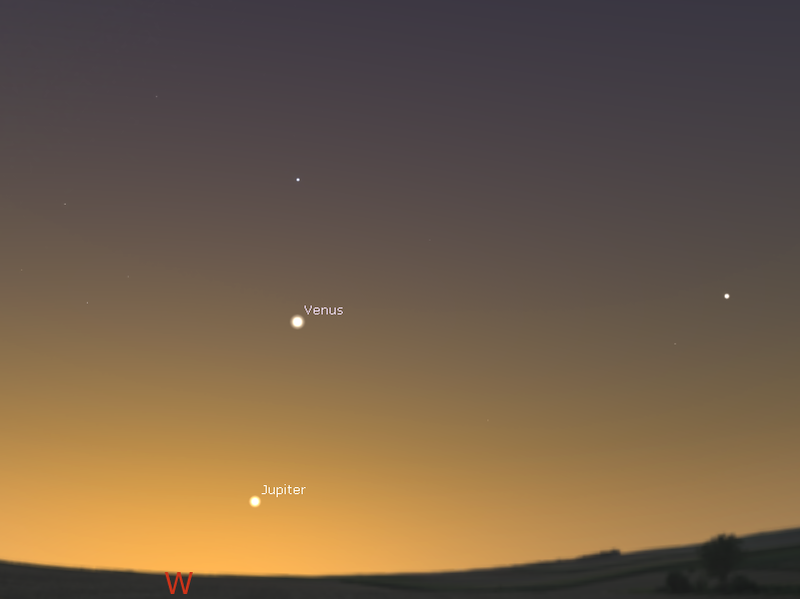 Jupiter is very low in the western evening sky as the sun sets, and is too close to the horizon for decent telescopic observation setting shortly after nautical twilight. This will be the last week to see Jupiter easily before it is lost in the Sun's glow. 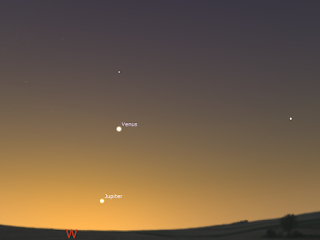 Venus continues to rise above the twilight glow this week. Venus is high in the dusk sky and can be seen easily. From a little after half an hour to an hour after sunset to just under an hour after sunset, Venus and Jupiter make a line that points to the triangle formed by Mars, Antares and Saturn. After Jupiter sets Venus remains visible for at least an hour and a half after sunset, into truly dark skies. During the week Venus comes closer to the bright star Spica, the brightest star in the constellation of Virgo. By the end of the week Venus is just below Spica. Evening sky on Friday September 9 looking west as seen from Adelaide at 22:00 ACST. Mars, Saturn, Antares and the Moon form a diamond shape. Similar views will be seen elsewhere in Australia at the equivalent local time. (click to embiggen). Mars is in the western evening skies in the body of the Scorpion (strictly, it is in the constellation of Ophiuchus, as is Saturn). Mars moves further down the body of the Scorpion this week, moving away from Saturn and the red star Antares. The triangle they form continues to lengthen. All week Mars is within binocular distance of the globular cluster M19. It can only be seen in binoculars or a small telescope, but the paring with Mars will be very nice. On the 11th and 12th Mars will be a finger-width from the 4th magnitude double star 36 Ophiuchi, which is easily separated into its double components in small telescopes. Details for both events are here. Mars was at opposition on May 22, and is still visibly dimming, but is still a modest telescope object. It is visible all evening long. In even small telescopes Mars will be a visible, but gibbous, disk, and you may even be able to see its markings. Saturn was at opposition on the 3rd of June. However, Saturn's change in size and brightness is nowhere near as spectacular as Mars's, and Saturn will be a reasonable telescopic object for many weeks. Saturn is reasonably high in the evening sky and is readily visible next to Scorpius. Saturn is still high enough for good telescopic observation in the evening. In even small telescopes its distinctive rings are obvious. On the 8th the Moon is close to Saturn. Carnival of Space #473 is Here!